Our seats were turning to dust. Tommy removed the old vinyl and what was left of the foam from the frames. A hammer helps persuade a stubborn clip. Hog ring pliers make all the difference when doing upholstery work. 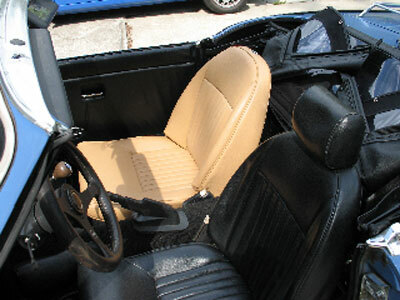 Black isn’t exactly the best color for a Florida interior, as you could easily cook an egg on the seats after a hot day. Although the Spitfire had only one rip in its seat upholstery, the foam underneath had turned into powder. Whenever we took a seat in the car, a shower of foam would fall onto the floor. Also, black isn’t exactly the best color for a Florida interior, as you could easily cook an egg on the seats after a hot day. With both of these problems in mind, we ordered a complete interior kit in “biscuit” from Victoria British. After a few days of waiting, our new interior arrived. The kit was very complete—it even came with full color instructions. 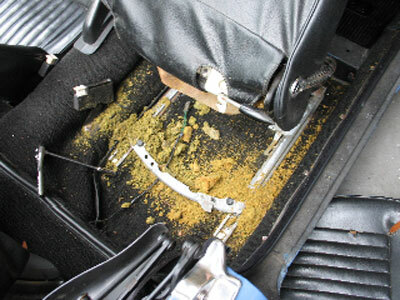 Before we could install the new seat foam and coverings, we had to pull all of the old material off. We spent about an hour pulling clips out of various layers of fabric, then sat back to admire our work. From there, we cleaned and painted the entire frame, and replaced any broken straps. 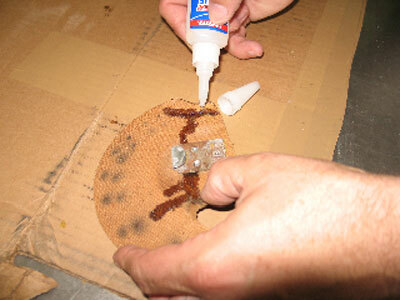 After the paint dried, we glued on the foam. Now that the foam was on the frame, it was time to put on the covering. 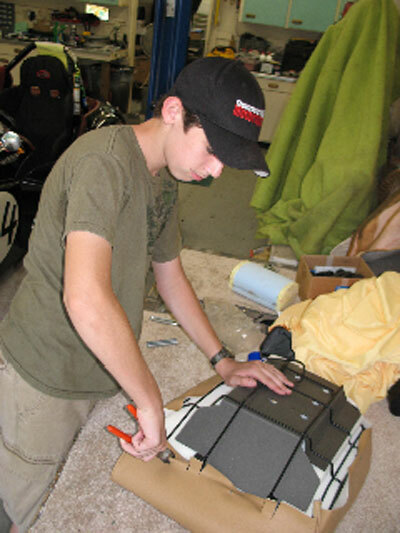 We turned it inside out and rolled it down the seat frame, affixing the bottom with the factory clips. With the seat back done, we tackled the seat bottom. 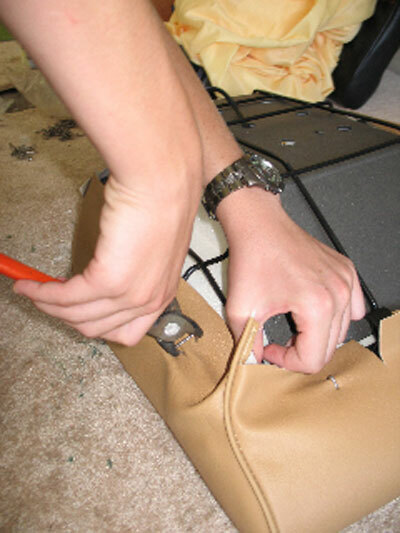 First, we had to pull out all of the hog rings that held the old fabric in place. 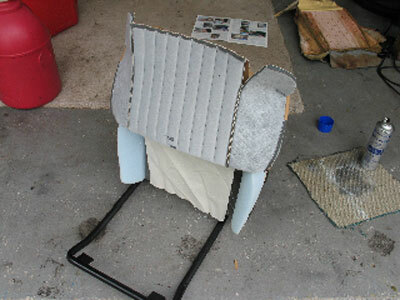 After that was done, we removed the old fabric and foam. 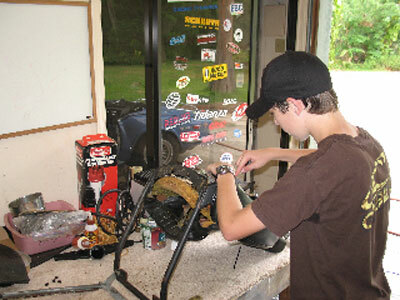 Next, we cleaned up the seat pan and painted it flat black. Once it dried completely, we placed the new foam in the pan, stretched the fabric over it and secured it with new hog rings. 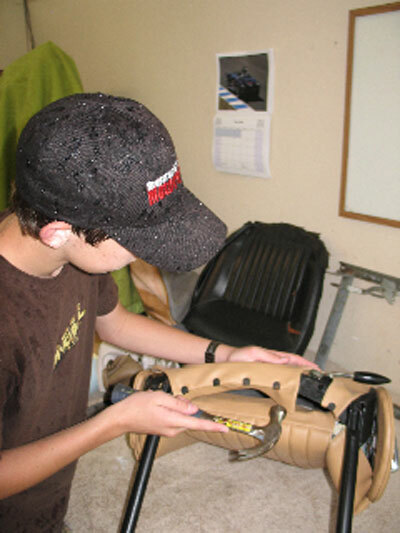 The seat bottoms were done. With the first seat done, we simply followed the same steps for the other. The new seats are much more comfortable than the last, and they look better, too.